Manasquan Village Townhouses an active adult community in Manasquan NJ. Manasquan Village Townhomes is an Active Adult community in Manasquan. a small town in southern Monmouth County which measures 2.5 square miles. The beachfront is a very popular area with surfers due to the jetty protruding into the Atlantic Ocean at the Manasquan inlet, which enlarges the waves. The inland portion of the Intracoastal Waterway terminates in the Manasquan Inlet. 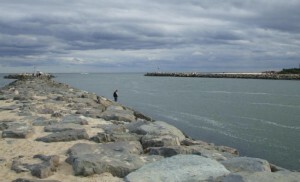 The Manasquan Inlet connects the Atlantic Ocean with the Manasquan River, and was dug in the 1920’s. Also, there are many marinas along the Manasquan River. Manasquan Village Townhomes is an upscale, but small community. In 2007, these three level townhouses were built, and have 3 bedrooms, 2.5 baths, basement and a one car garage. Additionally, most of the townhouses have a private elevator to all three levels. Ownership of the homes in condo style, as a result, exterior maintenance of the buildings is done by the association. Monmouth County offers transportation services for all over 55 communities to local shopping centers such as malls and supermarkets. This is a scheduled service and there is no charge for this. There is also a medical transport bus that will take people to any medical facility or doctor’s office in Monmouth County. However, there is a small charge for this service. Train service to New York is available at either the Asbury Park or the Manasquan stations.